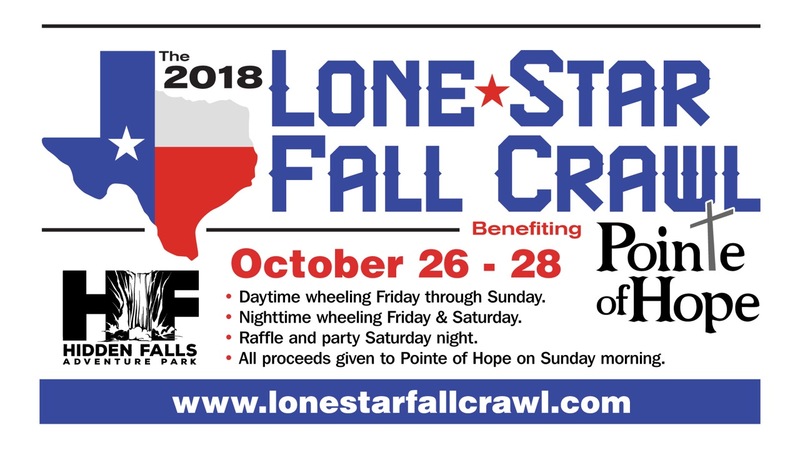 Q: WHAT IS THE LONE STAR FALL CRAWL? A: THE FALL CRAWL IS AN EVENT THAT WAS ORIGINALLY CREATED IN 2012 BY JKFREAKS.COM, AN ONLINE JEEP COMMUNITY. IT IS CURRENTLY AN INDEPENDENT EVENT AND IS OPEN TO ALL THOSE IN THE OFF ROADING COMMUNITY. Q: I SEE THAT IT IS A CHARITY EVENT. WHO DOES IT BENEFIT? A: IT BENEFITS POINTE OF HOPE, A FAITH BASED CHARITY IN LEANDER, TEXAS. POINTE OF HOPE FEEDS AND CLOTHES MUCH OF THE HOMELESS AND NEEDY POPULATION AROUND THE AUSTIN AREA, AND IS AFFILIATED WITH ROCKPOINTE CHURCH IN LEANDER, TEXAS. Q: WHAT IS HIDDEN FALLS ADVENTURE PARK? A: HIDDEN FALLS IS THE LARGEST OFF ROAD PARK IN TEXAS, COVERING APPROXIMATELY 3,000 ACRES AND FEATURING ALMOST 250 MILES OF TRAILS. Q: WHAT ARE THE ACCOMMODATIONS AT HIDDEN FALLS? A: HIDDEN FALLS FEATURES PRIMITIVE AS WELL AS IMPROVED CAMPSITES, ALONG WITH RV SITES AND CABINS. RESERVATIONS ARE REQUIRED FOR ALL SITES EXCEPT PRIMITIVE CAMPING AND CAN BE MADE ONLINE AT THEIR WEBSITE. Q: I’M NOT REALLY THE CAMPING TYPE. ARE THERE ANY HOTELS NEARBY? Q: WHY SHOULD I REGISTER FOR THIS EVENT? A: WHEN YOU REGISTER YOUR FEE GOES DIRECTLY TO POINTE OF HOPE, TO HELP THOSE IN NEED. YOU WILL ALSO RECEIVE A DISCOUNTED RATE ON ALL YOUR CAMPING AND WHEELING FEES. YOU WILL ALSO RECEIVE TEN FREE TICKETS TO THE SATURDAY NIGHT RAFFLE. Q: WHAT IS THE RAFFLE ABOUT? A: EVERY YEAR, THANKS TO OUR AMAZING SPONSORS, WE HOLD A RAFFLE ON THE SATURDAY NIGHT DURING THE EVENT. WE TYPICALLY GIVE AWAY SEVERAL THOUSAND DOLLARS WORTH OF PRIZES. TICKETS ARE AVAILABLE FOR PURCHASE AT THE CHURCH HILL CABIN EVENT HEADQUARTERS, LOCATED IN AREA B OF THE PARK. TICKETS ARE $2.00 EACH AND YOU CAN PURCHASE AS MANY AS YOU LIKE. ONE HUNDRED PERCENT OF THE TICKET SALES GO TO POINTE OF HOPE. Q: I’M NEW TO OFF ROADING. IS THERE ANYTHING FOR ME AT THIS EVENT? A: OF COURSE! WE HAVE BEGINNER GROUPS THAT WILL CHALLENGE BOTH YOU AND YOUR VEHICLE, BUT WON’T GET TOO TOUGH. ALSO, MOST OF THE MORE DIFFICULT AREAS ON THE TRAILS HAVE BYPASSES, SHOULD YOU NOT FEEL COMFORTABLE TACKLING THOSE OBSTACLES. Q: IF THIS A FAMILY FRIENDLY EVENT? A: YES IT IS. MIND YOU, ALCOHOL IS PERMITTED IN THE PARK, AND PARTYING DOES GO ON. BUT IT IS IN NO WAY A FREE-FOR-ALL AND SINCE 2012 WE’VE NEVER HAD ANY ISSUES. WE PRIDE OURSELVES ON HOLDING AN EVENT THAT IS FUN FOR ALL AGES. WE LOOK FORWARD TO SEEING ALL OF YOU THIS FALL!